High-tech lasers have been used to unlock the secrets of Stonehenge. The work at the ancient site in Wiltshire has already found two carvings which are invisible to the naked eye. The markings left by bronze axe heads are between four and six inches long. Similar carvings were found at the site in the 1950s, but archaeologists say these are now too badly eroded to be seen. The research by Wessex Archaeology and 3D laser scan firm Archaeoptics began in the summer of 2002. They used a low-powered laser beam to scan the stones without causing damage to the rock's structure. Three stones have been scanned to date, and the investigating team insists a full survey of all 83 would probably reveal more carvings. 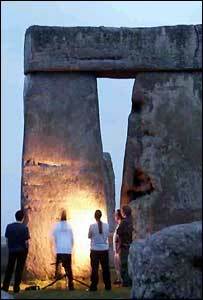 "The laser scanning has opened up a whole new way of seeing Stonehenge," said Tom Goskar of Wessex Archaeology. "With more time we could uncover many more and make plainer the outline of some known carvings that are difficult to see. "This would give us a much better idea of the extent of the carvings and help us achieve a greater understanding of the monument."